Written by Jessica Smith on November 28, 2018 . Posted in blog, Philanthropic Planning. We just celebrated one of my favorite days of year – Giving Tuesday. It is one of my favorite days because, perhaps even more so than on Christmas, it is a reminder to think outside of ourselves. With companies, like Facebook, matching contributions, and #GivingTuesday challenges, there is increasing access to donations. This is great for nonprofits doing amazing work, but as a donor, how do you filter out all the buzz and peer pressure and ensure the nonprofits you support are effective? Too often, efficiency gets confused with effectiveness. An efficient organization eliminates waste and maximizes productivity. An effective organization fulfills its mission. While an effective organization should consider efficiencies, efficiency alone is not the goal. All too often, donors are quick to zero in on the percentage of donations used for administrative expenses, like salaries, overhead, and general expenses to maintain the operation of the organization. While this is an important consideration, it is just one consideration when evaluating a nonprofit’s effectiveness. Mission: The most important determination of whether a nonprofit is effective is if it is achieving its mission. Make sure you know what you are supporting. Do a little research to determine the nonprofit’s mission. The first place to start is the nonprofit’s website, but there are other third-party resources like GuideStar (www.guidestar.org), Charity Navigator (charitynavigator.org), and your local Community Foundation that can help. Goals and Programs: Does the organization have very specific and measurable goals? Think SMART goals – Specific, Measurable, Achievable, Relevant, and Time bound. Are the nonprofit’s programs set up to achieve the specific goals and does the nonprofit report on the performance of those goals – positive and negative? Most nonprofits offer an annual report to donors. Ask for the previous year’s report in advance and pay particular attention to how achievements are discussed. The more transparent, the better! Financial Wellbeing: Pay attention to the financials of the organization, but as a whole, considering the nonprofit’s mission, goals, and programs. If the nonprofit is tackling big tasks, it needs a strategic, focused leader at the helm with other dedicated talented individuals supporting, just like a for-profit organization does. Be careful not to judge too quickly based on the amount paid in salaries alone. Also consider where the nonprofit is located and the marketing and overhead costs necessary to accomplish goals. 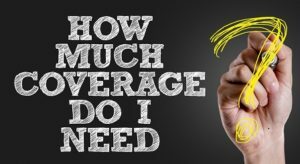 Just like any other business, marketing and overhead are needed expenses to help facilitate higher performance. It may be helpful to compare financials of different nonprofits, but only do so if you are comparing apples to apples. The nonprofits should do very similar work, in a similar location with similar goals. Leadership: Check into the leadership of the nonprofit, both the internal leadership and the board leadership. Is the leadership engaged? Can they speak to the mission and goals of the organization? Do they implement a strategic plan? Are there checks and balances? Are there policies and procedures in place? Are there regular board meetings and term limits for board membership? Sometimes measuring the effectiveness of the leadership can be difficult. Before making large contributions to an organization, it may be helpful to sit down and interview both the Executive Director and the board (or at least a representative of the board) to ensure that they are on the same page and working well together. Collaboration: Think about the nonprofits with the best reputations. Many of them have dedicated volunteers and donors who are committed to the mission. This doesn’t mean that the nonprofit has to be one of the biggest, it just needs to be able to facilitate work through others. It needs an engaged group advocating for the mission. The leaders, volunteers, and donors need to be willing to break down fences to partner with others to create great impact, even if that means sharing resources and taking a smaller cut of the pie. Above all, it is important that the resources you give align with your core values and passions. Before you make your next gift, I challenge you to take time to consider your top three key core values and three areas of interests and ask yourself how they relate. Are there any common threads? Write down your findings and keep them as a reference for the next time you are asked to give. If the request doesn’t align with your core values and passions, give yourself the freedom to say no. If the request does align with your core values and passions, say yes and follow through to ensure your gift is used wisely. You hold the power of impact in your hands. What will you do with it? Written by Jessica Smith on October 1, 2018 . Posted in blog, Non-Profit Spotlight. Sometimes, it’s difficult not be consumed by negative newspaper articles or cable news shows that leave you frazzled and questioning the direction of our nation. Luckily, our school kids, with the help of the Liberty Learning Foundation, are on their way and ready to show us what it means to be a good citizen. The Liberty Learning Foundation (LLF), a nonprofit and nonpartisan 501(c)(3), is dedicated to teaching, inspiring, and empowering school children to know about civics, history, good character, community engagement, financial responsibility, and career readiness. These important subjects are often cut by school systems eager to focus on teach-to-test subjects like science and math. Liberty is built on the belief that science and math alone cannot continue our nation’s progress, and that a curriculum that includes lessons about the history of our nation and what it means to be a good citizen add to the overall well being of students. The mission for the Liberty Learning Foundation began with a simple question: How can schools, community leaders, and businesses work together to ensure out next generation understands its important role in America’s future? The answer is a ten-week Super Citizen program that includes a big kick off with an appearance by Libby Liberty, a professionally-developed curriculum, project-based learning, and an ending celebration that shows children what they’re capable of when they work together. 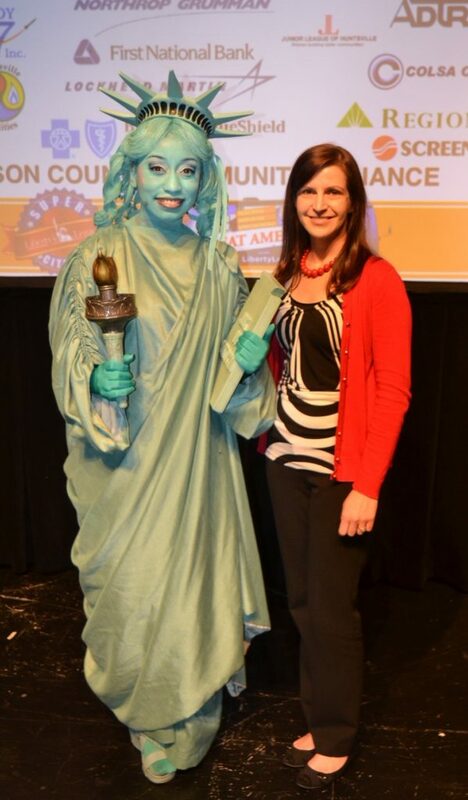 I recently had the great opportunity to attend the Liberty Learning Foundation Kick-Off Event for Huntsville City Second Graders (and get my picture with Libby Liberty). It was such a fun and unique event that served as a pep rally for the ten-week educational program. The children left excited about the opportunity to learn more about history and servant leadership. Liberty Learning Foundation currently serves over 40,000 students in 270 schools and communities around Alabama, and they want to grow! They primarily rely on private donations to sustain and grow the program because they don’t want to burden school systems with an unfunded program. Let us know if you are interested learning more about Liberty Learning Foundation or attending one of their local kick-off programs with area schools. If you are a believer in the importance of teaching history, civics and good citizenship to children, it is an event I think you’ll enjoy. Our friend, Dr. John Kvach, Vice President of Liberty Learning Foundation, has offered personal invitations and would be happy to speak with you more on how the Liberty Learning Foundation is creating the “next generation of great Americans”. Written by Jessica Smith on July 2, 2018 . Posted in blog, Philanthropic Planning. Everywhere you turn, it seems like we are hearing about the differences in generations. It is almost certain that if I attend an educational conference, there will be at least one session about how to work with the next generation or how the next generation is different from all the other generations. These conversations are usually targeted toward the workplace, but I don’t hear many targeted toward the family. However, the differences apply across industries and families alike. Don’t we desire to better communicate at home and passing on education and skills in the home as much as in the workplace? A few years ago, I came across Strangers In Paradise – How Families Adapt to Wealth Across Generations by Dr. James Grubman. Dr Grubman is a psychologist who works with individuals with wealth. Through his research, he has addressed the question of how families can share education and skills and better equip the next generation to inherit and sustain wealth. It is an interesting read that compares migrating to the “Land of Wealth” to migrating to a new country. He essentially divides the “Land of Wealth” into two groups: immigrants and natives. Immigrants are those who create the wealth. They often come from humble beginnings and build their wealth by taking risks, like starting a business. Immigrants make up 80% of the inhabitants of the “Land of Wealth”. The remaining 20% are the natives. They are second and later generations who have grown up with more opportunities and experiences because of the family’s wealth. Many times, their parents have wanted them to have all the things they couldn’t have as a child. Natives are usually less experienced with risk and may not understand the amount of hard work that was necessary for the previous generation to generate the wealth. As you may expect, each generation has its own struggles. The immigrants may struggle with trusting the next generation to carry on the wealth (or family business). They may also struggle with accepting and using the wealth, remembering the days before their success as hard and financially tight. This non-acceptance may lead to poor decisions and a tendency to give away wealth to others too easily. On the other hand, natives can struggle with a sense of entitlement due to a lack of understanding about the hard work necessary to create it. They may overspend or not consider the financial consequences of their decisions. Some may even feel pressured to carry on the previous generation’s values and desires because they do not think the wealth belongs to them. Dr. Grubman argues that there are different skill sets that are necessary at each generation level in order for family wealth to continue. As you can see from the chart below, the skills needed grow with each new generation. This is why it is so hard to keep family wealth for the long term. Just like an immigrant to a new country, immigrants to wealth primarily transition into the “Land of Wealth” in one of three ways. Some try to avoid the wealth and deny they are wealthy. They continue to live as they were before they earned their wealth, fearing the loss of relationships or judgements from their old circle of acquaintances. It is important to note that remaining frugal is not avoidance. Avoidance is an inability to accept the wealth or a strong desire to ensure others do not know about the wealth. Some immigrants embrace wealth to its fullest. They may see it as a way to create happiness. While avoiders may not want to leave their old circles, assimilators may completely leave their old circles to create new circles with those who also have wealth. They tend to raise their own and their children’s standard of living drastically in an effort to fit into their new land and may do so at their own detriment. Some assimilators become more philanthropic, but may do so to appear wealthy, not necessarily because they feel a strong connection or desire to do good. The last group of immigrants takes a more balanced approach and integrate their old and new relationships, communities, and values. They may look to their wealth to help them create new opportunities and experiences, but also remember the importance of saving and giving for purpose. They make a point to teach their children about their past while also giving them the opportunity to enjoy and learn from their new life of wealth. Integrators tend to be more adaptable. 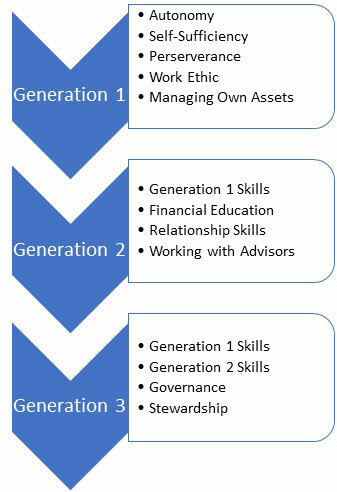 Dr. Grubman further suggests that in order to allow for integration and to pass along and teach the skills needed at each generation, it is best to introduce the concept of family capital. He divides family capital into four subgroups. Human capital includes the values and personal attributes each individual brings to the family. Intellectual capital is the education and skills each member can provide. Social capital includes the family’s connections, community involvement, spiritual capital and philanthropy. Financial capital is the wealth and stewardship of the family. What are the individual attributes of each family member, and how does the family use and share the skills of individuals within the family? How can the family enhance members’ skills? What are the family’s core values and mission? How is the family using each member’s education? What/Who are the family’s connections? 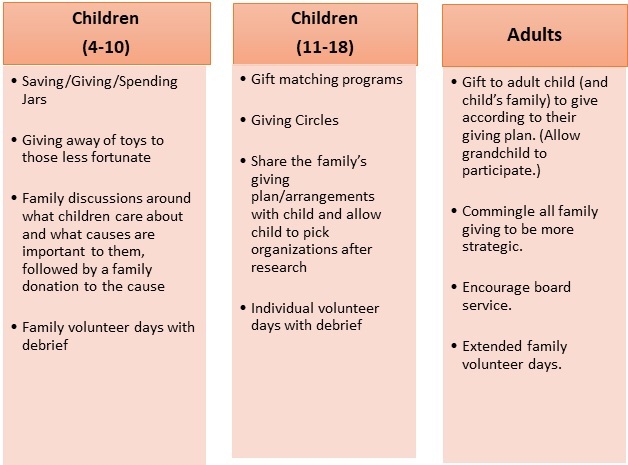 What are the family’s philanthropic goals and how can each individual contribute to the goals? How can the financial capital be used to address the human, intellectual, and social capital? How will stewardship be addressed? Philanthropy is an excellent way to help address some of the questions above and to begin to build the skills that generation 2 and 3 need in order to inherit and pass on family wealth. For example, in order to begin to build human capital at an early age, parents could encourage their children to use their interests and abilities to volunteer or to look for volunteer opportunities that will enhance a child’s skills. Encouraging children to assist in determining the family’s giving goals, identifying which nonprofits the family should support, and what amount of support to give are ways to address the family’s capital while building leadership, financial, and relationship skills. Regardless of your wealth level, improving your children’s and grandchildren’s financial and philanthropic literacy is important. We invite you to contact us if you are interested in learning more about ways to implement Dr. Grubman’s research with your own family. Written by Jeff Jones on May 8, 2018 . Posted in blog, Non-Profit Spotlight. I had the good fortune of serving in Leadership Huntsville/Madison County’s Connect Class 19 with Melissa Reynolds, Executive Director of Merrimack Hall Performing Arts Center. I saw and felt Melissa’s passion around her work with Merrimack Hall, and I have had the joy of seeing the teams of entertainers from Merrimack perform at a number of events around town. They never fail to put a smile on my face and fill the house will applause. Merrimack Hall Performing Arts Center is a 501©(3) nonprofit organization located in the historic Merrimack Mill Village neighborhood of Huntsville, Alabama. 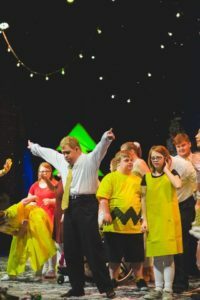 Merrimack offers arts education and social and cultural opportunities to children, teens, and adults with intellectual and physical disabilities. Debra and Alan Jenkins purchased Merrimack Hall in May 2006 and established the organization as a 501©(3) nonprofit. After nearly $2.5 million in renovations donated personally by the Jenkins family, Merrimack Hall opened to the public in 2007. The facility is now home to a 300-seat performance hall, 3,000 square foot dance studio, and community spaces. Merrimack Hall utilizes these spaces as a venue for socialization and activities for the individuals enrolled in their outreach programs. Happy Camp – A series of half-day summer camps. Merrimack Hall serves hundreds of children and adults with special needs diagnoses such as Down syndrome, autism spectrum disorder, cerebral palsy, spina bifida, and a host of other conditions. They believe everyone deserves the right to participate in the arts regardless of their disabilities. Their Happy team can be found performing all over the city of Huntsville. Visit the Events section of their Facebook page for where you can find them next. Merrimack Hall relies on the support of over 800 volunteers each year. Volunteer coaches work with the students in their Johnny Stallings Arts Program (JSAP) to learn music, art, and dance. More importantly, they serve as mentors and friends to their partners with special needs. In each program component of JSAP, they encourage their volunteers to interact with students in a meaningful way to create lasting friendships. For more information, visit them on the web at http://www.merrimackhall.com/, by calling (256) 534-6455, or by e-mail at info@merrimackhall.com. Written by Jeff Cedarholm on April 26, 2018 . Posted in blog, Investment Planning. Most of us vividly remember particular incidents in our lives. So it is with my chance meeting with Martin Whitman, founder and driving force behind the Third Avenue Value fund company. He passed away last week at age 93, and to quote his remembrance in last week’s Wall Street Journal, “He was an extraordinary investor, impassioned philanthropist, impactful teacher, and a true capital markets pioneer.” He was all of those things and more. In January of 1999 I took a week off from my day job to attend Benjamin’s Graham’s Columbia Business School course on value investing, resurrected after fifty years and taught by Bruce Greenwald. As you might expect, New York City in January is cold and dreary, and I found myself totally unprepared for the coursework coming at me. On the second day of the course, it was announced that we would have a mystery guest speaker to close the day with a reception afterwards. That speaker was Marty Whitman. Keep in mind that January 1999 was close to the top of the internet bubble, which made his talk on deep value investing in both the stock and distressed debt markets even more interesting. Obviously, value investing was totally out of favor and Marty, along with other well-known value guys, like Jean Marie Eveillard of First Eagle and Robert Sanborn of Oakmark, was having a hard time and losing clients in that environment. During the reception in his honor, I introduced myself and was surprised how he drew me into a memorable conversation. He asked where I was from, and when I told him North Alabama, he asked where again. When I responded Gadsden, he laughed said he had been stationed at Camp Sibert just on the outskirts of Gadsden during WWII. I quickly understood that he had more knowledge of my hometown during that period than I did, and he enjoyed remembering stories from that time and place. He was very personable and also wanted to know about my family and career. When he found out that I was considering a career change, it became an even more important conversation. He urged me to consider an investing career and to follow a different path. I am forever grateful! So, you might ask, “What is the relevance of this story”? First, Mr. Whitman was an extraordinary investor and seemed to be passionate about his craft and life in general. His style was global and always deep value. It led to him to outperform the stock market more often than not. Second, he was interested in people, who they were, and what they were doing. He didn’t have to talk to me, but his advice helped. And third, I very quickly learned that although over the years, he had been winning with deep value, that no style, even his, worked all the time. Flexibility and understanding of the rotations of the markets is very important, important enough to understand when and if his style or another style fits into a portfolio. In a 2015 interview he talked about how after the financial crisis, his funds struggled because the Fed’s quantitative easing and the lack of volatility. With the recent volatility, this investment climate appears to be returning to being a “stock pickers market.” Marty, along with many of his deep value peers, is undoubtedly smiling. Written by Jeff Jones on December 21, 2017 . Posted in blog, Tax Planning. We previously shared with you details from the U.S. House of Representatives’ Tax Cut and Jobs Act and the U.S. Senate’s Joint Committee on Taxation’ version under the same bill name, Tax Cut and Jobs Act. After negotiations between the two governing bodies, the Tax Cut and Jobs Act of 2017 is finalized and headed to the President’s desk. Below is a brief rundown of some of the most notable changes for individuals and families. Most of the new tax laws are in effect for tax year 2018 and beyond unless otherwise noted. While House Republicans had proposed a four bracket system for income taxes, the TCJA retains the seven bracket system. However, rates and income thresholds have been adjusted. This means that almost all U.S. taxpayers will see a reduction in income taxes for tax year 2018. The current system’s income tax brackets are 10%, 15%, 25%, 28%, 33%, 35%, and 39.6%. The new system sets the brackets at 10%, 12%, 22%, 24%, 32%, 35%, and 37%. The income threshold amounts will continue to adjust for inflation. The decreased tax rates are not permanent, however, as there is a sunset provision. After 2025, without future legislation, the tax rates would increase. The Senate and House will be faced with deciding the fate of the sunsetting provision in future years. One of the most notable pieces of the TCJA is the elimination of personal exemptions. The new legislation instead combines personal exemptions and the standard deduction into one single increased standard deduction amount. The new standard deduction amount is $12,000 for individuals, $24,000 for joint filers, and $18,000 for head of household. The additional standard deduction of $1,250 for blind individuals or someone over age 65 remains. For larger families, this will mean an overall decrease in the combined amount when compared to the current combination of exemptions and standard deduction. However, the TCJA increases and expands the Child Tax Credit, from $1,000 to $2,000 per child, which should more than offset the loss of exemptions in most families. High income earners, $200,000 for individuals and $400,000 for couples, begin to phase out of the Child Tax Credit. Changes to exemptions, standard deductions, and the child tax credit are subject to the 2025 sunset provision. The Pease limitation on itemized deductions has been repealed. The Pease limitation is a reduction in certain itemized deductions that takes affect depending upon your filing status and income level. Once your income crossed the threshold amount ($261,500 for individuals and $313,800 for married filing jointly in 2017), itemized deductions would begin phasing out. The rule acts as a surtax on high income earning households. The repeal will result in a 1% to 1.3% reduction in taxes for high income earners. The sunset provision applies to this repeal, meaning the Pease limitation could return in 2026. Elimination of miscellaneous itemized deduction, including tax preparer fees, investment management fees, and unreimbursed employee business expenses. $10,000 cap on combined state/local income tax and local property taxes. Deductible mortgage interest only on the first $750,000 of new principal debt. Mortgages taken prior to December 15th, 2017 retain deductibility on the first $1,000,000 of principal debt. Elimination of home equity indebtedness interest deductibility. If a home equity loan is used to substantially improve the home, it is treated as “acquisition debt” and is still deductible. Medical deductions were not repealed. Instead, the deduction was temporarily reduced to 7.5% of AGI for tax year 2017 and 2018. It reverts back to 10% of AGI in 2019. Current rules limits donations to public charities to 50% of your AGI. The new rules increase the limitation to 60% of AGI making it easier to claim larger contribution or use carryforward charitable deductions. The charitable mileage rate, which was expected to be increased, remains unchanged at 14 cents. There had long been concern that the 0% long-term capital gains and qualified dividends tax rate would be eliminated, but the TCJA retains the three-bracket system of 0%, 15%, and 20%. Under the old system, taxpayers in the 10% and 15% income tax bracket had a 0% capital gains tax rate. With the new tax bracket system, the capital gains rate is tied to an income threshold amount rather than the brackets. Thus, individuals with $38,600 and couple with $77,200 or less in income will have a 0% capital gains tax rate. Instead of having the 20% capital gains tax rate take effect at the highest tax bracket, it now takes affect at the threshold amounts of $452,400 for individuals and $479,000 for couples. This means some tax payers in the new 35% income tax bracket will find themselves in the highest capital gains tax rate. Unfortunately, the 3.8% Medicare surtax on capital gains and qualified dividends still applies. Individuals with income over $200,000 and couples over $250,000 will face the additional surtax. This effectively retains a four tax brackets of 0%, 15%, 18.8%, and 23.8% for capital gains and qualified dividends. The original bills by both the Senate and the House proposed a complete repeal of the Alternative Minimum Tax (AMT) system for individuals. Unfortunately, in negotiations, the AMT survived although the exemption amount has increased. This difficult-to-understand supplemental income tax system dates back to 1969 and was originally designed to ensure wealthy taxpayers paid their fair share of taxes. Yet, over the years, the AMT began affecting more and more middle-income taxpayers. With the exemption amount increased to $70,300 for individuals and $109,400 for joint filers, fewer middle class taxpayers will be affected. The Kiddie Tax is a tax on unearned income for children under the age of 19 or full-time students under 24. In 2017, tax law allowed for the first $1,050 of unearned income to be tax-free, the following $1,050 taxed at the child’s rate, and any income above that amount taxed at the parent’s rate. TCJA changes this so that the any amount above $2,100 is taxed at trust tax rates, not the parent’s tax rate. This is significant because the highest trust rate is 37% at ordinary income of only $12,500. It would take total income over $600,000 at the parents’ joint rate in order for the 37% tax bracket to apply. The estate and gift tax exemption has effectively doubled allowing an individual to pass $11.2M and couples to pass $22.4M estate tax free. Portability of the exemption survived; if the first spouse to die doesn’t use the exemption, the surviving spouse can port the unused amount to themselves. The top rate remains at 40%. Some early discussion indicated that the estate tax could be repealed at a future date, but the repeal did not make it into the legislation. These changes are subject to the 2025 sunset provision. Tax brackets for trusts and estate were compressed, much like the individual income tax rates, leaving just four tax brackets – 10%, 24%, 35%, and 37%. However, the income thresholds tied to those tax rates did not change very much. Thus, it only takes $12,500 in trust or estate income before hitting the top bracket. While a number of changes were expected to affect education planning, such as repeal of the Coverdell ESA plan and education tax credits, most did not make it into the final bill. However, one change is significant. 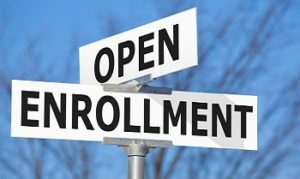 You can now use up to $10,000 per year from 529 plans for private school expenses for elementary and secondary education. Previously, only the Coverdell ESA could be used tax-free for private educational institutions. The bill eliminates the tax deduction for alimony paid and no longer taxes the alimony received for divorces finalized after December 31st, 2018. Deductibility of student loan interest and out-of-pocket classroom expenses for teachers remains unchanged. 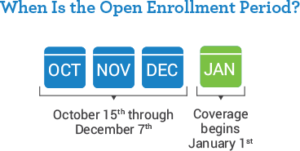 The mandate requiring that individuals retain health insurance has been repealed for 2019 and beyond. No changes to 401(k) plans, IRAs, and Roth IRAs. However, the ability to recharacterize a previous Roth conversion has been repealed. There are new rules for deferred compensation plans and equity granting plans, like stock option plans, that could result in funds being taxed earlier than under current plan designs. As a result, there may be changes to current plans. Written by Jessica Smith on December 1, 2017 . Posted in blog, Philanthropic Planning. Longview’s Jessica Hovis Smith is proud to serve on the Women’s Endowment Advisory Council. The Council is made up of women leaders from the community acting as volunteer stewards for the Endowment. The Community Foundation celebrated the launch with the Legacy of Love event. Click here for photos from the event. Click here to learn more information about the Women’s Endowment, including answers to frequently asked questions. Contact us if you are interested in learning more or getting involved. Please remember that past performance may not be indicative of future results. Different types of investments involve varying degrees of risk, and there can be no assurance that the future performance of any specific investment, investment strategy, or product (including the investments and/or investment strategies recommended or undertaken by Longview Financial Advisors, Inc.), or any non-investment related content, made reference to directly or indirectly in this newsletter or post will be profitable, equal any corresponding indicated historical performance level(s), be suitable for your portfolio or individual situation, or prove successful. Due to various factors, including changing market conditions and/or applicable laws, the content may no longer be reflective of current opinions or positions. Moreover, you should not assume that any discussion or information contained in this newsletter or post serves as the receipt of, or as a substitute for, personalized investment advice from Longview Financial Advisors, Inc.. To the extent that a reader has any questions regarding the applicability of any specific issue discussed above to his/her individual situation, he/she is encouraged to consult with the professional advisor of his/her choosing. Longview Financial Advisors, Inc. is neither a law firm nor a certified public accounting firm and no portion of the newsletter or post content should be construed as legal or accounting advice. A copy of the Longview Financial Advisors, Inc.’s current written disclosure statement discussing our advisory services and fees is available for review upon request.